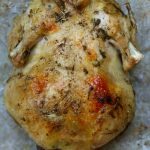 If you love getting those whole rotisserie chickens at your grocery store, you’ll love this recipe for pressure cooker whole seasoned chicken. The chicken is cooked in minutes in your Instant Pot (my chicken was actually totally frozen) and then stuck under the broiler to crisp up the skin. Slice the chicken up to eat plain or use it in any recipes that call for cooked chicken. Add 1 cup of water to the bottom of the Instant Pot and put the bay leaf in there too. Place the trivet in the bottom. In a little bowl combine the butter, rosemary, sage, thyme, salt, pepper and garlic powder. Use your fingers to run this mixture all over the chicken. Place the chicken, breast side up, on the trivet. Cover the Instant Pot and set the timer on manual for 60 minutes. Make sure valve is set to “sealing.” When the timer beeps let some of the pressure release naturally for 15 minutes and then switch the valve to “venting” and release the rest of the pressure. Use a thermometer to check the temperature of the meatiest portion of the chicken. It should read 165° F. If it’s not up to temperature then you’ll want to cover the pot and cook on manual setting for 5 more minutes. Optional: Place the chicken on a cookie sheet and put under the broiler for 5 minutes to crisp up the skin. Slice chicken and serve. Season to taste. We like to save the leftovers to use in other recipes or make sandwiches and wraps with it.